There’s a line in the second half here which I wish I’d noted down somewhere else, rather than just as a draft text message on my phone [memo to self: send memo to self]. But the basic concept was along the lines of, “Does everyone on this tour bus possess a dark secret in their past?” And it’s an accurate one, because, it turns out, yes – everyone does. However, rather than merely acknowledging the horror trope, some credit is due here for embracing it. Since those dark secrets are exactly why they are on the bus to begin with. Naturally, it’s not long before he’s scything his way through the passengers, both local and visitor, while they bicker among themselves. There’s Jennifer (Beaumont), an Australian on the run from her dark secret, who is taking anti-psychotics. She’s the first to see the killer miller in action, and no-one believes her due to those meds, which the Doctor in the party, Nicholas Cooper (Taylor) identifies. He himself has become a coke addict, after his involvement in the death of a patient – there’s his dark secret. Everyone else has something similar e.g the father enjoying some quality time with his (hemophiliac) son, whose mother is suspiciously not answering her phone. The first three-quarters are largely mediocre stuff, enlivened occasionally by a couple of decent kills. Despite the obvious windmillage, there’s precious little sense of place, once the bus-doors close and we leave the canals of Amsterdam behind. It’s Dutch almost entirely in name only, with a commercially-sensible cast of mostly English-speaking tourists, plus a local photographer after some calendar shots, and the driver. It’s only at the end, when the motivations of the miller (as well as others) become clear, where the film becomes something more than a cheap, semi-competent foreign slasher. It’s almost Hellraiser-like in tone, with the killer possessing very specific goals in his choice of target. Shame it didn’t get there earlier. Interesting also to note the relative toning-down of the title for the US market by removing the word “massacre” from the original. Outside of a few title changes for WalMart, e.g. they insisted A Christmas Horror Story became A Holiday Horror Story, while Deathgasm became Heavy Metal Apocalypse, it’s usually gone the other way. 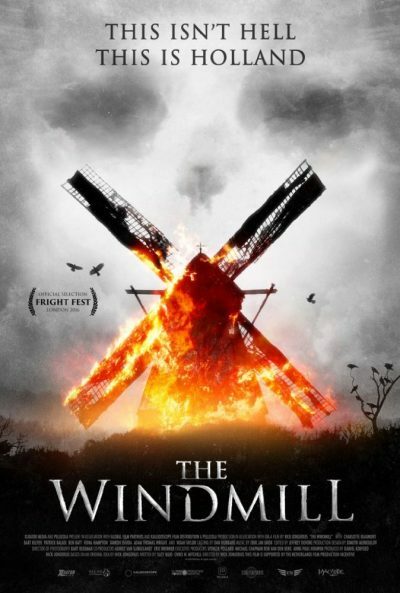 Maybe the original original title was The Windmill Chainsaw Massacre.